Vladivostok Sea Commercial Port (VSCP), part of FESCO Transportation Group, completed one stage of the container terminal berth reconstruction project, informs the port’s press service. The modernization project involved repairing the existing quay equipment and installation of new marine fenders allowing the terminal handle vessels with larger drafts. Thus, the maximum allowable draft at container berths #15 and #16 was increased by 1.4m, to 11.4m. For the vessels with LOA less than 216m, the maximum draft limit at berth #15 will be up to 11.9m. The VSCP container terminal modernization project includes also purchase of new handling equipment and reconstruction of berth and road pavement. In June 2018, the port intends to add for operation 7,950 sq.m. of reinforced pavement area for container handling and also expects during the year 2018 a delivery of more than 20 units of new equipment: reachstackers, port trailers, RMG cranes. The reconstruction of the container facilities is aimed at increasing the efficiency of the Vladivostok port services and attracting more vessel calls. Today, the port handles 15 regular international and cabotage lines linking Vladivostok with eight countries as well as with other Russian Far East regions. In 2017, VSCP expanded its connectivity by adding MCC Transport Singapore Pte. Ltd. (part of Maersk Group) that provides a regular liner service between Vladivostok and the ports of Jakarta, Surabaya, Hong Kong, Shenzhen, Ningbo, Shanghai, Kwangyang and Pusan. In 2017, the Vladivostok port handled 7.5 mln tonnes of various types of cargo, which is 33% up to 2016 and is an absolute record of the port’s throughput in 120 years of its history. The container volume rose by a steep 42% as compared to 2016, up to 467,940 TEU. The port handled 2.99 mln tonnes of general cargo (+43%) and 37.8 th. Ro-Ro units (+52%). 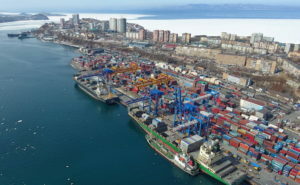 The Vladivostok port, together with FESCO Transportation Group, is constantly working on expanding the regular rail services that allow fast container delivery to/from various Russian regions by the Trans-Siberian Railway Network. Thus, new container block trains were launched last year – to Krasnoyarsk and Ekaterinburg.